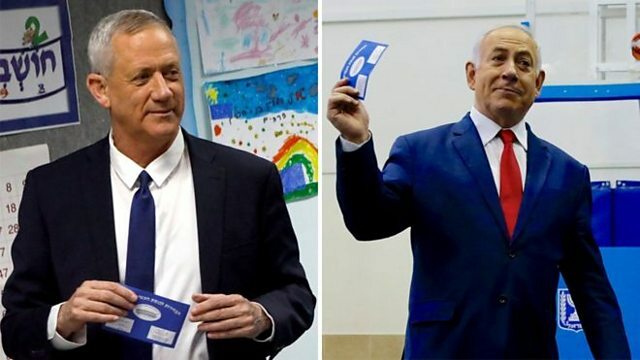 The Blue and White alliance of former military chief Benny Gantz was projected to win 36 or 37 seats, with the Likud party of Prime Minister Benjamin Netanyahu taking 33 to 36. Israel's election has ended, but the result is anything but clear. Both the current prime minister, Benjamin Netanyahu, who leads the conservative Likud grouping, and his main rival, Benny Gantz, who leads the Blue and White group, have claimed victory despite exit polls that suggested they are neck and neck. Lahav Harkov, senior editor at the Jerusalem Post speaks to us from Likud headquarters in Jerusalem. Prisoners at Lowdham Grange prison in England are running their own television channel. It's designed to teach inmates valuable skills. But staff say it's also helping to keep the jail safe, as the BBC's Jeremy Ball explains. Plus, feeling stressed about work? You're not alone - poor management style and increased workloads are contributing to a rise in overall stress in the workplace, according to the latest study by The Chartered Institute of Personnel and Development. All this and more discussed with our two guests throughout the show: Ralph Silva of the Silva Network, in Toronto. And Catherine Yeung, Investment Director at Fidelity International in Hong Kong.